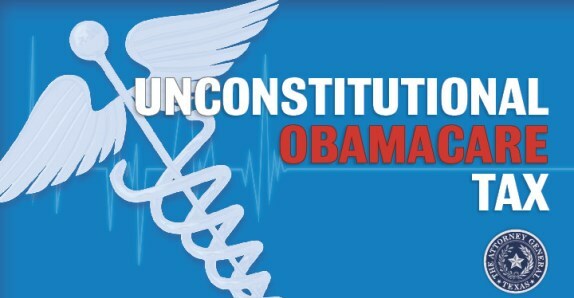 On Monday, 18 state Attorneys General and two Governors filed suit to have Obamacare held unconstitutional. In 2012, the Supreme Court ruled 5-4 that ObamaCare’s individual mandate was constitutional because Congress has the power to levy taxes. As our friend, former Virginia Attorney General Ken Cuccinelli posted on Facebook, the Obamacare opponents now have a simple and excellent argument for their suit; with the Obamacare “tax” gone, the constitutional underpinning for the law no longer exists. In NFIB v. Sebelius (2012), the Supreme Court upheld Obamacare under Congress’s taxing power due to the financial penalty levied against individuals who do not purchase the mandated healthcare. At the same time, the Court held that Americans could not be ordered to purchase Obamacare’s “minimum essential [healthcare] coverage,” because such a mandate violated the Commerce Clause of the Constitution. Thus, said Cuccinelli, the only thing that saved Obamacare from being found unconstitutional in 2012 was its financial penalty for those who do not buy the mandated health insurance coverage, because Congress had the power to enact the legislation under its constitutional taxing power. On December 22, 2017, President Trump signed the Tax Cuts and Jobs Act of 2017 into law. Among other things, this legislation eliminated the tax penalty of Obamacare, without eliminating the mandate for the purchase of healthcare. While the health insurance mandate was held unconstitutional in NFIB, the tax penalty is what saved Obamacare from being overturned as unconstitutional. The new GOP tax law “eliminated the tax penalty of the ACA, without eliminating the mandate itself. What remains, then, is the individual mandate, without any accompanying exercise of Congress’s taxing power, which the Supreme Court already held that Congress has no authority to enact,” the complaint states. “Not only is the individual mandate now unlawful, but this core provision is not severable from the rest of the ACA—as four Justices of the Supreme Court already concluded,” reported The Hill’s Rachel Roubein. As Cuccinelli pointed out, now that the tax penalty has been removed from Obamacare, but the health insurance mandate remains, Obamacare is unconstitutional. That is why the 18 Republican Attorneys General and two Republican Governors (Bryant & LePage) have sued to have Obamacare held unconstitutional. The lawsuit filed today explains that in 2012 in NFIB v. Sebelius the U.S. Supreme Court narrowly upheld the core provision of the ACA—the individual mandate—because the Court viewed ACA’s penalty for not complying with the individual mandate as a “tax.” But now, with the recent passage of its tax reform package—the Tax Cuts and Jobs Act of 2017—Congress has repealed this tax, while leaving the mandate in place. Since the Supreme Court has already held that Congress has no authority to impose the individual mandate on Americans without invoking its taxing authority, the repeal of the tax renders the individual mandate unconstitutional. And, since the ACA is dependent on the individual mandate, the ACA itself is now unconstitutional. We thought that Obamacare was unconstitutional when it passed, and we were shocked when the Supreme Court narrowly upheld it on the shaky reasoning that the Obamacare mandate penalty was a tax, even though Democrats said it wasn’t a tax during the bill’s passage. Now that that slender thread has been cut we hope the Supreme Court will remain consistent, follow its own precedent, and find that this time Obamacare really is (and we mean really) unconstitutional. Submitted by evergreen on Sat, 03/03/2018 - 13:33. I hope this carries strong weight with the American citizens that we may help support this necessary measure. I also want the names of all AGs w/states that we may know whom to contact to support this.